The Sino-German Institute for Legal Studies in cooperation with CeMEAS offers a unique double degree program in Chinese Law and Comparative Law. The program is interdisciplinary and provides students with an advanced knowledge of Chinese Law, language and culture together with the analytical and methodological skills to critically examine and discuss recent developments in China and East Asia. The Sino-German Institute for Legal Studies is a joint project of the Georg-August-University Göttingen and the University of Nanjing. Its aim is to promote dialog between the German and Chinese legal cultures. This takes place by way of cooperation in teaching, research and legal practice. 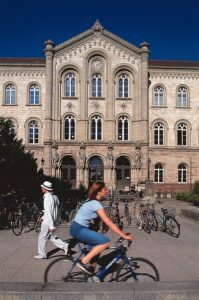 The degree program comprises a total of four semesters, two of which are spent in Göttingen and the remaining two in Nanjing. Its purpose is to give significant insight into Chinese Law to students who have already completed a degree in Law or Sinology.